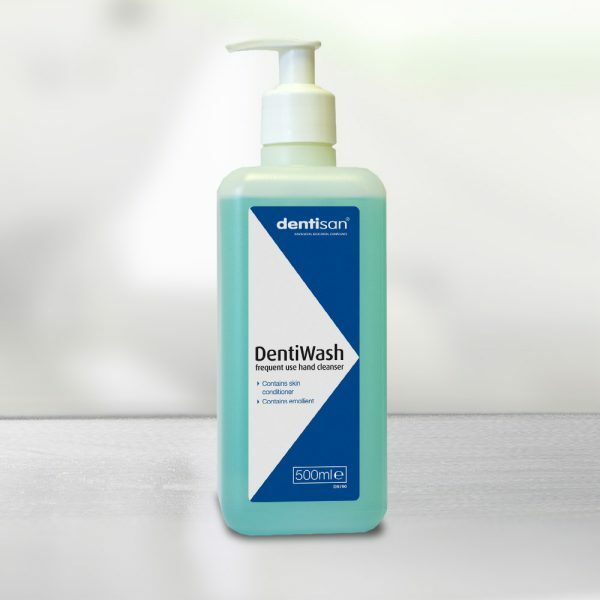 A hand cleanser for use in dental, healthcare and scientific environments, ideal as a frequent use hand wash. DentWash is perfume and solvent free and contains skin conditioner and emollient for added protection against dryness and chapping. Mild soap should be used when washing hands. Bar soap should not be used. Apply the liquid soap to wet hands to reduce the risk of irritation, and perform hand-washing under running water. Ordinarily, the hand-wash rubbing action should be maintained for about 15 seconds. After the exercise, the hands should be visibly clean. Where this is not the case, the hand hygiene procedure should be repeated. DentiWash should be used as part of a robust hand care routine, in tandem with a post-wash sanitiser and, if required, a conditioning hand cream. Hand washing and disinfection should take place regularly – before and after treatment appointments; before donning and after removal of PPE; following the washing of dental instruments; before contact with instruments that have been steam-sterilised; after cleaning or maintaining decontamination devices; and on completion of decontamination work. Hand hygiene is crucial to maintaining the health of both patients and staff, and plays a vital role in preventing the spread of seasonal illnesses such as flu and norovirus.